It is the lot of the journalist, especially those who work in the print medium, to not be well known because it is the news, not they, that matters. For those who work mostly in the background, such as editors, the anonymity is even greater. Derek Ingram was even deeper in the background as he mentored and guided dozens of reporters around much of the globe to write features on their countries as founder and editor of Gemini News Service, headquartered in London, and his name is probably even less known that those of other journalists. But in a 26-year span, Ingram made an indelible mark on journalism in the so-called third world, mainly those areas that were former British colonies and went on to become part of the (British) Commonwealth. He proved a boon to journalists in the developing world who wanted to write for a wider readership than the one at home, for newspapers that hungered for original stories and for journalism as the profession struggled along with the small nations to find an identity. “By the mid-1960s, the colonial age was dead and in the new age of non-alignment and the desire to recreate separate national identities, many newspapers no longer wanted the kind of material that had been flowing to them from the big agencies and from the syndicated services of the western, mainly British and American, newspapers. For one thing, most of them were written for western readers,” Ingram told The Media Reporter 13 years after he launched the service. He was right about that. By 1994, the number of newspapers subscribing to the service totaled 100 including 15 in then communist eastern Europe and 22 in Africa. Dozens of journalists were writing about countries where they lived and there was no shortage of stories, each accompanied by a famed Gemini; in 1970, Gemini sent out 711 features. Ingram, who had been ailing for some years, died June 17, 2018 at his home in London, just days before his 93rd birthday. Ingram, who was never married, once said he got the idea for Gemini while lying on a beach in Morocco in 1966 and launched the service in January 1967, along with fellow journalist Oliver Carruthers, who put up the financing. He gave up a senior editor post with a British paper to take on his mission. He started out as editor of Gemini, which he led until December 1993, wrestling all the time with lack of financial resources. He gave up the post in December 1993 but stayed on as chairman of the company and a contributor. By 2002, Gemini ceased operations, despite two major efforts to keep it going. Besides his stalwart effort at Gemini, not just to spread the word but also to mentor journalists in the developing world and forge bonds among them, Ingram sought passionately to battle injustice and racism, notably as seen in then Rhodesia — now Zimbabwe — where a minority government ran a nation with a majority black population, a sort of mini-South Africa under apartheid. For his efforts to end the white regime, Ingram was made a Member of the British Empire (MBE). But to his scores of writers scattered across the Commonwealth, he will be remembered as the man who gave them an opportunity to tell their countries’ stories from the perspective of those who lived there. 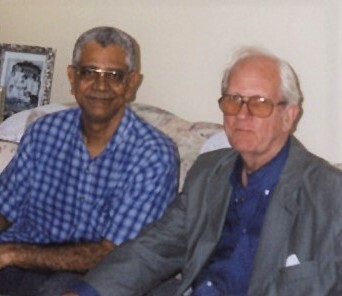 I was among the journalists who had an opportunity to write for Gemini, starting in the 1970s, through a colleague and good friend Hubert Williams, when we both worked at the Guyana Chronicle in Georgetown. (Williams, who was Gemini’s Guyana correspondent, went on to become Information Officer of the Caribbean Development Bank, from which he retired several years ago). Through Ingram and Gemini, I was able, I hoped, to broaden the knowledge of the outside world as to what was going on in Guyana, especially features outside of the routine news. During my career, I also worked in the Cayman Islands and in the Turks and Caicos Islands before I settled in South Florida. Gemini published features from me from those places, as well. I came to know Ingram very well over the years, though distance did not allow for as many meetings as I wanted. It was a joy to host him for even a couple of hours at my home in the Miami area several years ago when he was intransit on one of his numerous trips and made it a point to get together with me. But perhaps the highpoint of my relationship with Gemini and Ingram came in October 1992 when I was invited to attend a four-day seminar sponsored by the news service and the University of Regina School of Journalism and Communications in Saskatchewan, Canada. The topic was, “Reporting the Developing World after the Cold War,” which is just the sort of topic that Gemini and Ingram would want to be discussed. The book NEWS on a knife-edge came out of the seminar. Ingram and Gemini came into journalism at a time much different from today when the Internet and social media dominate the flow of news. But it was suited for the moment and it played its role well. Many of the Gemini journalists have no doubt long gone on to other endeavors following the closure of the service but I am sure that, like me, they have fond memories of the little news service that could – and did. Services will be held for Ingram in London this Saturday, June 30, 2018 near his London home. A memorial service will take place in the Fall, according to his nephew Rurik. Mohamed Hamaludin is a Guyana-born journalist who worked for several years at The Chronicle in the 1970s and in the Cayman Islands and Turks and Caicos Islands before emigrating to the United States in 1984 where he worked at The Miami Times, the Miami Herald and the South Florida Times. Though now retired, he writes a commentary every two or three weeks for The South Florida Times. Thanks for the great tribute to Derek, Mohamed. I worked at the Gemini office in London one summer. I was always impressed with Derek’s dedication and commitment to journalism internationally, as well as encouraging and developing writers within their home countries to share their stories with the rest of the world. I remember meeting you at the Regina seminar in 1992. It was an honour to meet you and share in the discussions there.